Why do you love working at Cutco and making the world's finest cutlery? We asked this question to some of our over 200 employees with 20 years of service or more. Above all else, we’re a family at Cutco. Family members, friends and neighbors work side-by-side at our factory, taking great pride in what they do. Our American workers are the heart of our company. Their experience and passion for making the best knives around is what keeps us going. Nothing leaves the Cutco factory unless it lives up to our high quality standards. Skilled workers perform quality checks throughout the manufacturing process to assure every knife meets our stringent requirements. It’s that attention to detail that makes Cutco special. Every Cutco product is backed by The Forever Guarantee which ensures we're there when you need us. We’ll sharpen and repair your Cutco knives, for free, forever. Our highly trained customer service representatives provide exceptional service. They’re just a phone call, email or social media message away. 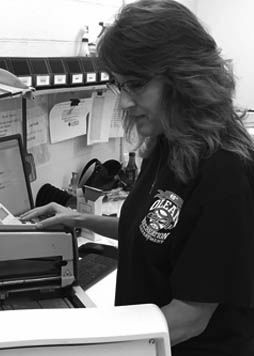 Julie joined the Cutco family as a part-time employee back in 1994 – but makes it clear she never felt like a part-timer, "I always felt like a valuable and important part of the team," Julie says. She loves the family culture and the Cutco customers who she says have become friends over the years. Julie is Cutco's Catalog Department Supervisor. Leave a comment or a simple thank you and we'll distribute them to all those who help make US great.